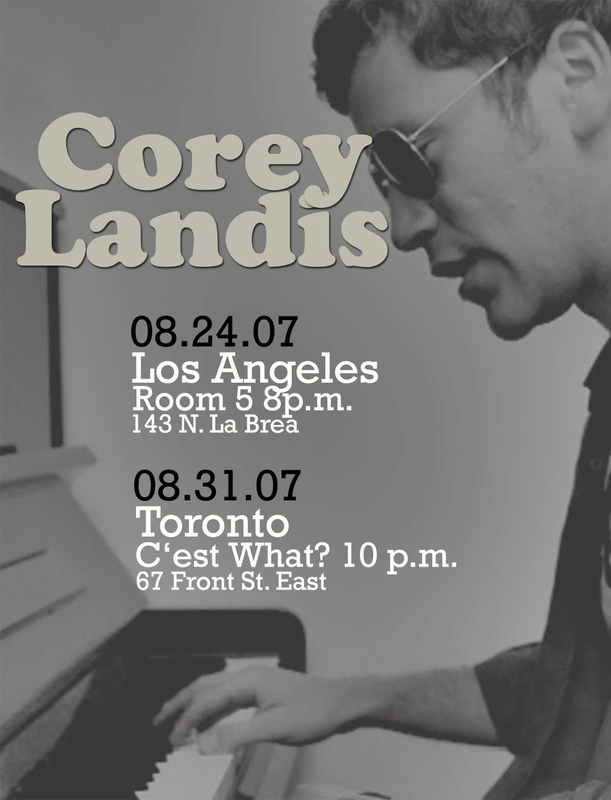 The "Corey Landis" album is now available at CDBaby.com, Amazon, and iTunes. The album features string and woodwind arrangements by film composer Joey Newman (of the same historic Newman film-scoring dynasty as Randy and Thomas) and was mixed by Greg Hayes (Warren Zevon, Tom Petty, Bruce Springsteen) at historic--and now defunct--Signet Sound, former home of Motown West. Go check out the new record at the links below, listen to some of the songs, and make your purchase. Go get it at iTunes! "A Message From Your Long Beach Circus Recruitment Office" has been referenced in a column in the Long Beach Press-Telegram along side nine other songs by artists such as Thompson Twins and Snoop Dog as a possible candidate for Long Beach's (un)official anthem. Check out the column here, and scroll to the bottom. I'll be periodically posting solo piano stuff, instrumentals, improvisations, etc., to a new page, located here. The first songs were recorded for entry in the Montreux Jazz Solo Competition... something I recognize I have no business entering. You can hear myself and co-star Glenn Vaughan talk about the new Ray Bradbury movie, "Chrysalis" on the Slice of SciFi Podcast here. Check back for updates! In music news (whaaa???) the full "Corey Landis" album is now available for digital download on the CDBaby page at a considerable discount. Check it out. Just in time for Festivus, I'm putting up my song "We Only See Each Other At Christmas (Just To Remind Ourselves Why)" for FREE download. Enjoy, and feel free to spread the joy around. It's available here on the media page and on MySpace. Holiday Gatherings Quarterly Magazine calls it: "...the most poignant song in the true spirit of the holiday since Elmo met Patsy, resulting in a little number about an elderly woman being trampled by a deer." Jews for Jesus heralds: "This song is the real reason for the season!" Wilford Brimley growls: "I have die-a-beet-us." In a match that seems too obvious and easily achieved to properly get excited about, Upright Citizens Brigade theater in L.A. is using the demo for "See You Next Tuesday" as the opening theme for their show of the same name. Go check out their great shows (some of which are FREE). The song will be re-recorded for inclusion in the next record, due around the same time Christ the Lord returns. For now, check it out on here. "The album shows that he has a sort of off-hand capacity for high quality musical contributions. 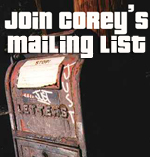 He probably hasn’t fully realized himself with this, his third CD, but Corey is deep in ability and observational intelligence and here he provides more than ample evidence of both. One senses that he is going to be around for a long while yet." Read the full review in pdf form. For your fist peek at the new, self-titled album (to be available in January '07), check out "So Right/So Wrong" at MySpace. Featuring a string arrangement by Joey Newman. Just in time for Thanksgiving...check out the brand new Christmas song up on MySpace. The forthcoming new, self-titled album is approximately half mixed at this point. Greg Hayes, who has worked with Warren Zevon, Tom Petty, Bruce Springsteen, and Randy Newman, among many others, is doing a fantastic job. He's tackled the songs that have Joey Newman's arrangments on them as well as the piano-and-vocal songs. The remaining 6 should be complete in a few weeks. So be looking for news of the new record to be available sometime around the 1st of the year. The studio sessions with the strings and woodwinds went great. Check out a few new photos and a short video from the day on MySpace. We're finally going into the studio Tuesday to record the strings and woodwinds for the new record, which is going to be self-titled. We're going to record all 4 tracks that have orchestration: "For My Heart (And All the Bereft)", a eulogy for the blood-pumping organ from someone who's literally had theirs ripped out; "Forget About It All", a short ditty about desperation and trips to the mall food court; "Heather's On Fire" which details a high school love triangle between jock, dork, and hot girl; and "So Right/So Wrong", about the difficulty of searching for identity as one continues to evolve. Or something like that. In addition, there's a new mixer on board, which I'm very excited about. Greg Hayes, recommended by Randy Newman's mixer, Frank Wolf, will be helming the final mix of the record. Continued thanks to Joey Newman and to Rhett Nelson, who transcribed Joey's arrangement for the musicians. We're moving along! Check out Radio Mike's show tonight (8/20/06)--a song or two of mine will be featured. He's been a big supporter of my music and other indie artists. Take a look around his site and help support HIM in the fundraiser he's currently having to keep his show going and make it bigger and better. There's a new song up at The Rhythm Coffin MySpace. The Rhythm Coffin is a side-project of sorts, fronted by a good friend of mine. Check out the song "Grimmland A Go Go" that I produced and sang on, which is hot off the goulish presses. Just click the proper icon in my friends section. PS to Los Angeles folks...be looking for The Rhythm Coffin's live debut coming sometime this Halloween!